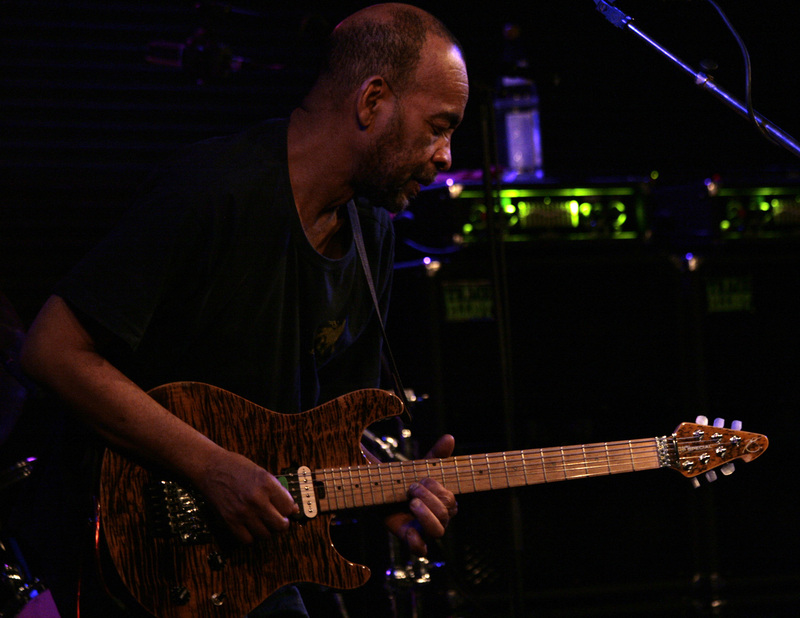 The 1980s featured a smorgasbord of great guitarists and Skip McDonald was right in the thick of it. He started the decade playing on many classic Sugar Hill Records sides and ended it as a member of futuristic funk/rock titans Tackhead. Since then blues-dub solo project Little Axe has been his chief musical outlet, a collaboration with legendary mixologist Adrian Sherwood and Sugar Hill cohorts Doug Wimbish on bass and Keith Leblanc on drums. 1994 debut The Wolf That House Built was a big critical success, but, after a run of middling albums through the noughties, Little Axe’s time somehow seemed to have come and gone. Until now. It’s unclear whether the state of the world (and the White House) has given him a new lease of life but McDonald’s bittersweet missives seem tailor-made for these times. This packed one-off London gig – promoting impressive, surprisingly upbeat new album London Blues – saw McDonald joined onstage by Wimbish, Sherwood and drummer Andy Gangadeen. Observing Sherwood was like watching a master cocktail-maker at work, adding his trademark delays and feedback loops with deft sleights of hand. The ageless Wimbish was in typically fine form too, creating mind-bending dub tones with some very nifty footwork – not for nothing has he occasionally referred to himself as the ‘Bruce Lee of bass’. But McDonald’s impressive vocals were the star of the show, and he also seems to have found his electric guitar mojo again. Old favourite ‘If I Had My Way’ has never sounded so apt (‘These are demon days/It’s a time of chaos, rage and anxiety/Where you gonna be when two worlds collide?’) while new songs ‘Snake Oil’, ‘Factory Girl’ and ‘London Blues’ were instant earworms. The latter could even make for a leftfield choice of single. Best of all though was chilling closer ‘Deep River’, an eerie death-dub with a central image of ‘a flower blooming in hell’, sounding a bit like an unlikely collaboration between Gregory Isaacs and Sarah Kane. There was a slightly valedictory feeling to the end of the gig; Wimbish, Sherwood and McDonald’s farewells were possibly more heartfelt than usual. It would be a great shame if this was the last we see of Skip’s Axe – the state of the world and a fine new album would seem to demand that he continue.